Earlier this month, the UCLA Labor Center, the United Electrical Workers (UE) and Rosa Luxemburg Stiftung convened in Chicago to discuss strategies for collaboration as their governments renegotiate NAFTA. In attendance were over 60 representatives from union and civil society organizations across Mexico, Canada, and the United States. Representatives expressed a vision for forming new relationships, either bi-national or tri-national in nature to protect workers from NAFTA’s negative impacts and ensure better wages, education, health care, and immigrant rights for workers across Mexico, Canada and the United States. The tri-national leaders gathered outside the Mexican Consulate in Chicago to demand that the well-being of Mexican workers be considered in the renegotiation of NAFTA. Representatives called for a raise in Mexico’s minimum wage, pointing out that raising Mexico’s minimum wage can also benefit workers in Canada and the Unites States, by making it less profitable for companies to move production. 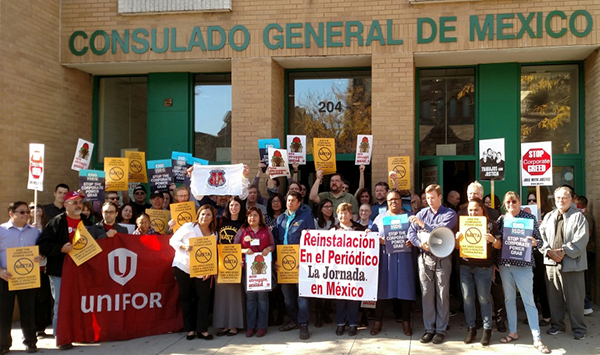 Union leaders and organizers expressed two other key demands: an end to corporate protections such as the Investor-State Dispute Settlement and facilitating the formation of unions in Mexico, Canada, and the United States.